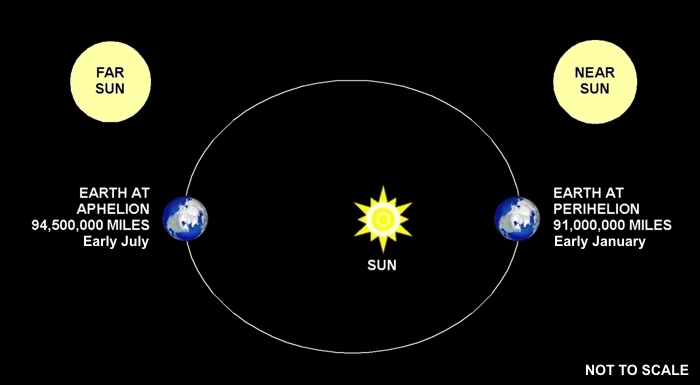 On January 5th, Earth passed through perihelion, its closet approach to the Sun. Earth’s orbit around the Sun is not a perfect circle. It’s an off-center oval-shaped curve, mathematically called an “ellipse.” That path brings it closest to the Sun around Jan 4 (± a day), and farthest from the Sun around July 4 (± a day). So the distance between the Earth and Sun changes continuously throughout the year. And this change does have an impact on weather, but probably not in the way you’d expect. and 7.5% would seem to be enough to affect the weather. However, seasonal temperature changes are mostly caused by the tilt of the Earth and the angle of sunlight. See the reasons for seasons here. Recall that when it’s winter up here in the northern hemisphere, it’s summer down under in the southern hemisphere. The southern hemisphere has more water than the northern hemisphere. Pick up a globe, take a look, and you’ll clearly see the difference. All that water helps moderate temperature changes. So, all things being equal, you’d expect southern hemisphere summers (which happen in January) to be warmer. But the extra water makes all things not equal. There are some noticeable differences between perihelion and aphelion. The Sun appears larger at perihelion. But at only 3.8% larger, your eyes could barely detect this difference if you looked for it. Check out the two Sun graphics above. Does the Sun on the right look larger? It is — by exactly 3.8% (in diameter). A more significant difference is the UV level outside. As with solar heating, the UV is also 7.5% more intense (all things being equal). For us northern hemisphereans, that underscores the importance of continuing to use a good sun screen lotion, even in the winter. And, skiers take note, snow on the ground reflects UV, further increasing exposure.